Polyarthritis (also known as polyarticular arthritis) is defined as arthritis or joint pain that affects four or more joints simultaneously. The term itself simply describes the number of joints involved and nothing more. As such, it can be used to describe any number of conditions, permanent or transient, in which more than four joints are affected. 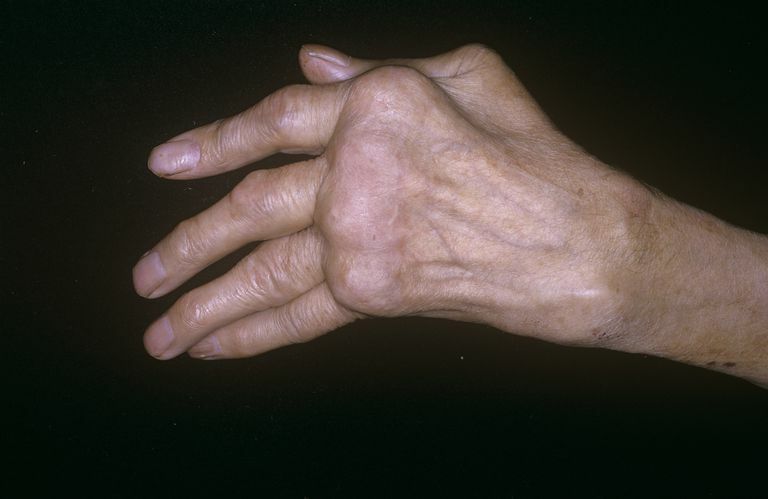 Polyarthritis is most often associated with autoimmune diseases such as rheumatoid arthritis (RA), but can also be brought on by certain viral infections. Polyarthritis is most often caused by an autoimmune disorder, in which a person's immune system mistakenly attacks its own cells and tissues. The causes of autoimmune disease are not well understood but are believed to be strongly associated with genetics, environment, and possibly exposure to radiation and toxins. Because autoimmune diseases tend to trigger an all-body response, those involving the joints will usually not appear in isolation as they might with osteoarthritis. Polyarthritis can also occur as part of an acute illness such as rheumatic fever, as well as certain alphaviral infections, including the Ross River virus, chikungunya virus, and Mayaro virus. In these cases, the inflammation may be transient and migrate between multiple joints. Cancers that affect the bones can also cause polyarthritis. When polyarthritis occurs in children, it is called juvenile idiopathic arthritis or JIA; the cause is unknown. Since polyarthritis is most commonly associated with autoimmune diseases, your physician will typically start by trying to pinpoint the underlying reason for your joint pain. Inflamed joints, tenderness, and swelling are common signs of autoimmune diseases. Your doctor will evaluate whether your pain is symmetric (symptoms are occurring in both hands or knees, for example) or asymmetric (just the joints on one side are symptomatic). People with RA tend to experience symmetric symptoms, while those with psoriatic arthritis often experience asymmetrical symptoms. For RA specifically, two blood tests—the rheumatoid factor test and the anti-cyclic citrullinated peptide (anti-CCP) antibody test—can help confirm the diagnosis. Depending on the suspected cause, X-rays, ultrasound, blood tests, and a joint fluid analysis (also known as arthrocentesis) may be ordered. Your doctor will also test for viruses if an infectious cause is suspected. Non-steroidal anti-inflammatory drugs (NSAIDs): Advil (ibuprofen), Aleve (naproxen), and Voltaren (diclofenac) can help relieve pain and stiffness. Disease-modifying anti-rheumatic drugs (DMARDs): These help slow the course of autoimmune diseases. Methotrexate is frequently prescribed to reduce joint damage caused by polyarthritis. Biologics: These drugs, which include Remicade (infliximab) and Embrel (etanercept), modify the immune system to reduce inflammation. Corticosteroids: These help control inflammation and reduce pain. Steroids can be taken orally or via injection. They should only be used in the short-term, as they can cause serious side effects. Warming therapies: Warm baths, warming mitts, and over-the-counter topical creams such as Aspercreme can temporarily relieve symptoms. Exercise: Low-impact exercises like swimming, yoga, and stretching, can help keep joints healthy. It's important to treat polyarthritis before the condition worsens and causes permanent joint damage. In rare cases, polyarthritis can cause scarring in the lungs, dry eyes, skin rash, and pericarditis (inflammation in the sac surrounding the heart). If you experience pain in four or more joints, a call to your doctor is in order. Ledingham, J. "Diagnosis and early management of inflammatory arthritis." BMJ. 2017; 358:j3248. DOI: 10.1136/bmj/j3248. Pujalte, G. and Albano-Aluquin, S. "Differential Diagnosis of Polyarticular Arthritis." Am Fam Physician. 2015; 92(1):35-41.